Wichita's Oldest School Building and Home To The Wichita School Disctrict Archives. The purpose of McCormick School Museum is to preserve the history of the Wichita public schools. 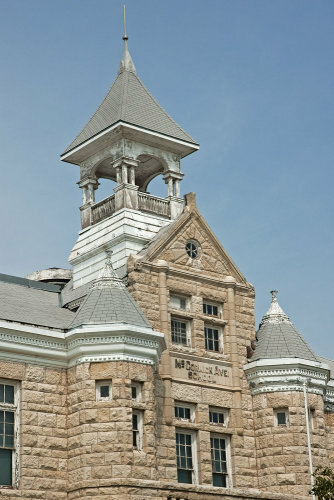 The museum is housed inside the McCormick Avenue School, designed by architects Proudfoot and Bird in 1890. The historic building is on the Natioinal Register of Historic Places and is the oldest school building still standing in the city of Wichita. This landmark has proudly served the community for more than a century. Come visit the 1890s classroom: read from McGuffy Readers and see what students used instead of a lap top. This is a journey into the past before computers, electricity or Ipods. The museum maintains a collection of school artifacts and has an ever-growing archive of photographs and information documenting Wichita public school history. There is a print shop, a 1920s science lab, a library, and rooms full of school furniture. The McCormick School Museum is always in need of donations and volunteers. If you would like to make a donation or volunteer please contact Paul Oberg at 316-841-6198. You can also download the "Buy A Brick" form to the left and make an inscribed paving stone to your favorite teacher, parent or youself on the pathway outside the school.